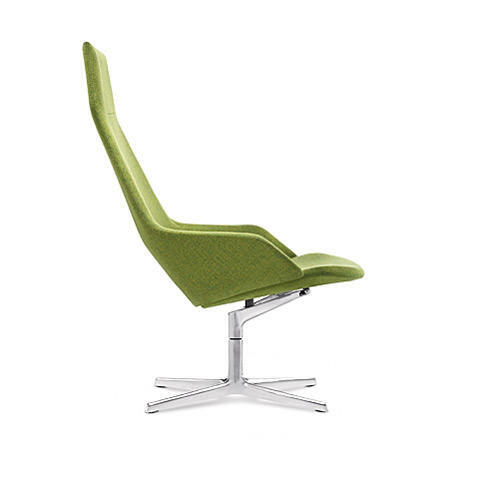 Elegant lounge armchair from the Aston collection by Arper. Aston is a complete seating system that ranges from the utter relaxation of the Lounge version, which is also suited to domestic settings, to the dynamic and distinguished personality of the Office, Direction and Conference versions for working environments, boardrooms and meeting rooms. All with rigorous, sophisticated style, enveloping comfort and a profound attention to ergonomics and livability. Sleek, light, dynamic lines for Aston, that comes in a range of fabric or leather coverings to match any decorating style. The lounge chair designed for contract use, also fits perfectly into the domestic habitat, with its matching Aston Ottoman footrest. The central swivel structure comes in polished or painted aluminum. aston 1920 can be combined with the aston 1902 ottoman footrest. Every minute of the day, in all sorts of settings and all sorts of places all over the world, you’ll find a light yet luxurious presence that is versatile and stylish, sophisticated and natural. That presence is Arper. Among the Arper design classics are chair series such as Catifa and Aston and tables such as Nuur. Do you have a question about "Aston 1920"? How can we contact you?